New York City likes to see itself as informed and sophisticated, but the city’s response to its first case of ebola was anything but. 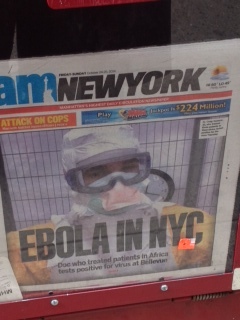 The headlines screamed “Ebola in NYC.” News stories on television and on the electrified sides of skyscrapers flashed danger. Photos of the doctor diagnosed, who had ridden the subway, eaten at a restaurant and gone bowling, made him out to be one of the FBI’s most wanted. Mayor Bill de Blasio felt it necessary to ride the subway to reassure the public it was safe for travel. The fear on the streets was probably heightened by the terrorist hatchet attack on four policemen the very same day. Fear was rampant. North of Manhattan a teenager got a nosebleed and worried that he had Ebola. Governors Cuomo and Christie, both of whom have reputations as bullies, issued a quarantine mandate for health workers returning from West Africa whether they were symptomatic or not. A nurse landing in Newark International Airport from West Africa was forced into an isolation tent despite the absence of any evidence she might be contagious. She was released to travel to Maine, where she is still fighting that state’s mandatory 21-day quarantine. Politicians are integrating fear-mongering into their campaigns, with New Hampshire Senate candidate Scott Brown calling for travel bans, and interdiction at the Mexican border. Ebola is very scary. If you doubt it, read The Hot Zone: A Terrifying True Story, by Richard Preston, published in 1994. Public health data bear out the assessment. Seventy percent (up to 90 percent according to the World Health Organization) of ebola victims in Africa die. There has been one death in the United States. Medical experts know what to do, and in the U.S. they have the resources to do it. The small handful of additional patients here who have tested positive and been treated have all ultimately been declared free of the virus. The best protocol is stopping ebola at its source in West Africa, especially Liberia, Sierra Leone and Guinea. That will take the continued involvement of Western health care workers, dedicated doctors and nurses trained in treating ebola cases and willing to go to the source to help stop its spread. The worst outcome of demonizing them upon their return and imposing excessive restrictions on their lives is deterring others from going to Africa to treat the afflicted. We should be treating these health workers like heroes. If you’re going to impose a 21-day quarantine for anyone who has had direct contact with ebola patients, perhaps it should be an all-expenses-paid vacation at a specifically designated resort, where they could be monitored, eat well, work out, relax, be in touch with their families – an upgraded R & R. U.S. troops building treatment facilities in West Africa are quarantined for 21 days in Italy and are apparently in good spirits. Nor should these nurses and docs lose any income from extreme protocols. They should receive full pay for their time in quarantine. Anything less is an unfair punishment that penalizes them for their service and discourages others from helping. For those who are not symptomatic, self monitoring, along with restricting access to public places like restaurants and public transportation, would seem reasonable and effective to reassure an anxious public. We should remember that the disease is not contagious until a patient is symptomatic, and then only with contact with bodily fluids or contaminated objects like clothing and bedding. Health workers know best what the stakes are in the spread of this terrible disease. Why should we expect them to act anything other than prudently, respectful of the general population and the public health implications of exposure to ebola? This entry was posted in Media, Politics and tagged Center for Disease Control, ebola travel ban, Governor Andrew Cuomo, Governor Chris Christie, Liberia, mandatory quarantine, NYC ebola case, Scott Brown, Sierra Leone and Guinea, terrorist hatchet attack in NY, The Hot Zone, World Health Organization. Bookmark the permalink. You nailed it once again. Good for you!